Salome. (No, not shalom!) She of the dance of the seven veils who delighted in kissing the severed head of John the Baptist. Of course you have. One knows instinctively that one’s readers are well educated. And hurrah for that! 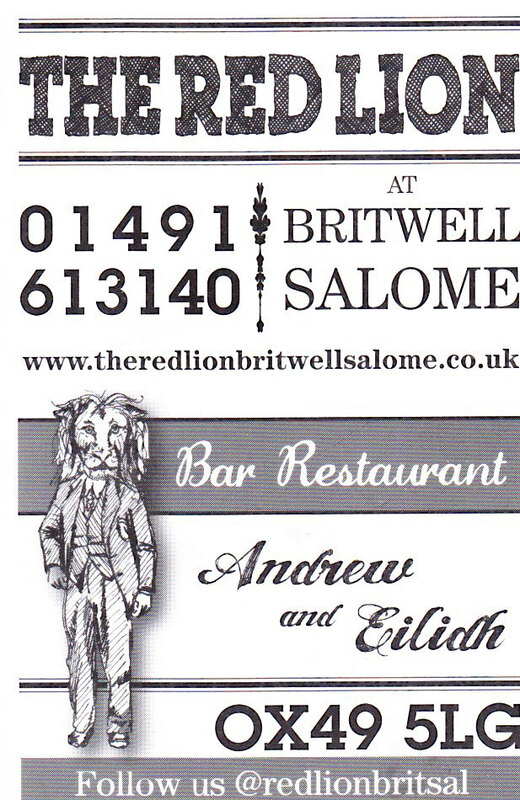 But have you heard of Britwell Salome, not her sister but the name of the town that is home to the Red Lion gastropub which is secreted in Oxfordshire. Their card (below), depicts the red lion as a rather well turned out chap in a suit. The eatery is small with a bar at the front and restaurant at the back. One opted for the only beer on offer. Harrumph! Fortunately it was excellent, However, a little more choice would be appreciated. The usual protagonists were in tow, Fortescue, Darymple and Durdle. We were dining that night at the Mole & Chicken and had planned to have a light lunch. However the menu did not lend itself well to lunch. One would have liked a sandwich or ploughman’s to be on offer in true pub tradition but alas t’was not to be. Prices matched those in Londinium and one elected to have sausages and mash which seemed pricey. Fortescue elected for soup which he seemed to enjoy. Durdle chose salad. The staff were attentive and friendly and made it a very pleasant dining experience. Next time one will arrive here for dinner rather than lunch and one’s rating might be increased. If one is in the area, it is worth a visit but make sure you are hungry.